Tele Control Basic for the Sub-Stations Scalable sub-stations based on SIMATIC S7 controls Overview. 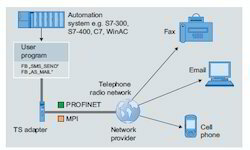 As a remote control system for simple control tasks, TeleControl Basic connects the control center with the remote sub-stations via GPRS or the internet. A sub-station enables both remote communication with a control center (central) and cross communication with other sub-stations. With the control center software Tele Control Server Basic, up to 5000 sub-stations can be managed efficiently and economically. The sub-stations consist of low-cost SIMATIC S7-1200 and S7-200 controls. The CP 1242-7 communication processor thus makes wireless communication for S7-1200 stations simple and flexible. The CP 1243-1 communication processor enables the installationof sub-stations of S7-1200 to connect to the internet via external router. The proven MD720 modem is also available for field stations based on S7-200. International approvals mean that it can be used worldwide. With the control center software Tele Control Server Basic, up to 5000 sub-stations can be managed efficiently and economically. The sub-stations consist of low-cost SIMATIC S7-1200 and S7-200 controls. 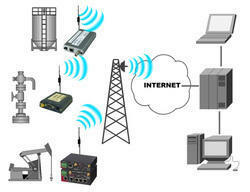 The CP 1242-7 communication processor thus makes wireless communication for S7-1200 stations simple and flexible. The CP 1243-1 communication processor enables the installation of sub-stations of S7-1200 to connect to the internet via external router. The proven MD720 modem is also available for field stations based on S7-200. International approvals mean that it can be used worldwide. With the control center software TeleControl Server Basic, up to 5000 sub-stations can be managed efficiently and economically. The sub-stations consist of low-cost SIMATIC S7-1200 and S7-200 controls. The CP 1242-7 communication processor thus makes wireless communication for S7-1200 stations simple and flexible. The CP 1243-1 communication processor enables the installation of sub-stations of S7-1200 to connect to the internet via external router. The proven MD720 modem is also available for field stations based on S7-200. International approvals mean that it can be used worldwide. complete remote management solution that enables you to monitor and control remote installations online. You can track performance, get alarms if something is wrong, and even manage and configure your equipment via a regular computer or smartphone. The Netbiter EC310 communication gateway connects to field equipment via several connection methods: Serial RS-232/485, Modbus RTU, Modbus-TCP or EtherNet/IP. The gateway sends data to the cloud-based Netbiter Argos data center via Ethernet communication. On-board I/O ports on the EC310 gateway provides the option to connect sensors and additional equipment to the system. FAST AND EASY DEPLOYMENTWherever your field equipment is located, just connect it to the gateway and you will be able to access equipment data online in a regular web browser. The plug-and-play functionality makes it possible to perform large-scale installations within minutes. FOR USE WITH ALL NETBITER SERVICESThe EC310 gateway supports all Netbiter Services: Remote Access, View & Control and Manage & Analyze. The cooling system temperature. In addition, unauthorized opening of the front is detected using a sensor. The automatic machine reacts independently to specific events – such as exceeding/falling below limits – and informs the maintenance staff. Irrespective of that, the automatic machine answers requests that have been received for process values. Sending an SMS message to one parameterizable phone number. Process values can be integrated in the message text. The send routine can be started from the user program of the controller using a trigger. received commands are executed in the controller and a confirmation/error message is sent to the mobile phone. 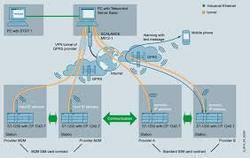 The SIMATIC CP 1242-7 modem is the core component of this solution. With the aid of the CP for the SIMATIC S7-1200, short text messages can be sent to any mobile phones and short text messages can be received from these mobile phones. The application example shows how to program the requirements for SMS communication in the user program of the S7-1200 CPU. You can use the functionality fully or partially for your own requirements or customize it. A SIMATIC CP 1242-7 (2) is connected to a SIMATIC S7-1200 controller 1211C (3) via the bus interface. A SIM card (5) is inserted in the GSM/GPRS modem and an ANT 794-4MR quad-band GSM/GPRS antenna (4) is used for the connection to the air interface. The power supply of all components is provided via a SIMATIC PM 1207 power module (1). 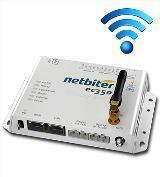 The Netbiter EC350 communication gateway connects to field equipment via several connection methods: Serial RS-232/485, Modbus RTU, Modbus-TCP or EtherNet/IP. The gateway sends data to the cloud-based Netbiter Argos data center via Ethernet or cellular communications. On-board I/O ports on the EC350 gateway provides the option to connect sensors and additional equipment to the system. 5-BAND 3G SUPPORTThe 3G communication provides increased performance compared to GPRS and also increases the geographical cellular coverage as it is possible to install the gateway where 3G is the only available network. 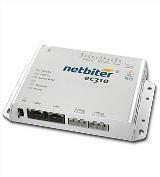 With support for 5 different 3G bands, the Netbiter EC350 is designed to work in any geographical location. FOR USE WITH ALL NETBITER SERVICES The EC350 gateway supports all Netbiter Services, Remote Access, View & Control and Manage & Analyze.